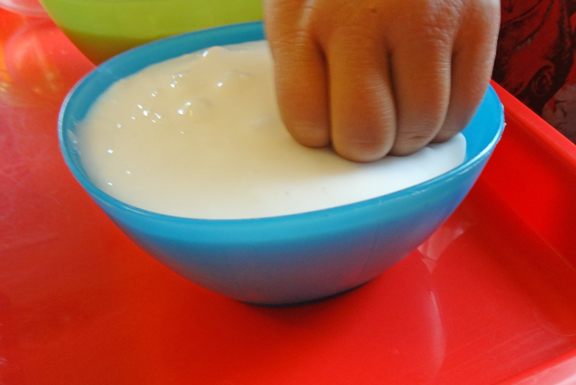 Flubber fun – check out this amazing polymer! Flubber is such a fun and amazing polymer. I can’t believe it took us so long to discover how amazing it is to play with! 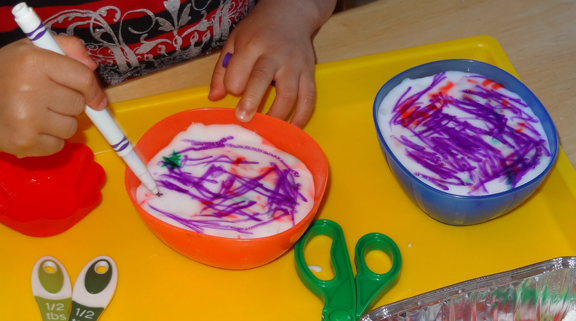 I’m always looking for new sensory play experiences for my kids, and our experience with flubber did NOT disappoint! 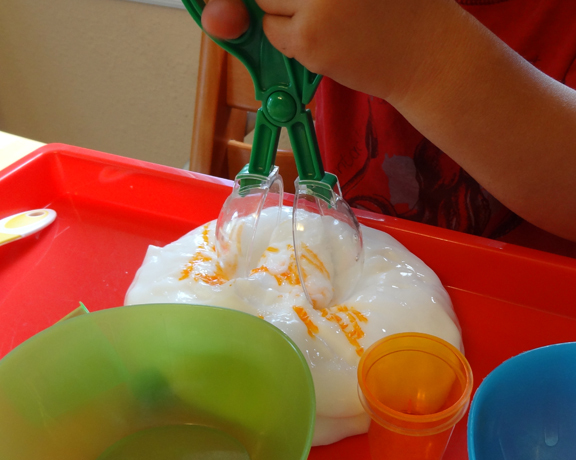 Flubber was unlike any other sensory material we’ve ever played with (and we’ve played with quite a few!). 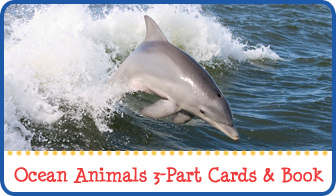 Check out what we did with this versatile, amazing polymer! 2 cups glue (We get the gallon size Colorations Washable School Glue from Discount School Supply . Once you have mixed the ingredients in both bowls well, combine them in one large bowl and mix well. The ingredients will almost immediately begin taking on a different consistency. I kneaded the mixture for a few minutes to help the water soak in, then I left it in the bowl for a bit to finish congealing. The end result was fantastic! First, there has been controversy surrounding the use of Borax. 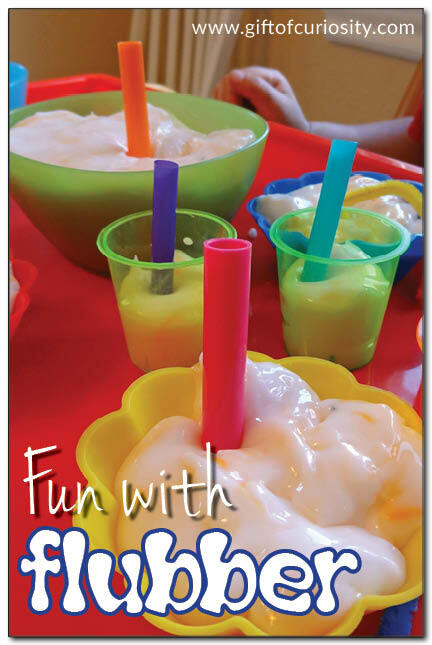 After reading some info about its safety here and here (as well as other places), I decided that the use of a small amount of Borax in this flubber recipe would be safe for my kids (who would not put it in their mouths), but I encourage you to read more and decide for yourself. Second, I’ve read various places online that this recipe works best with Elmer’s brand glue . We used the Colorations Washable School Glue from Discount School Supply and still had great results. Plus, the Colorations Washable School Glue is less expensive! 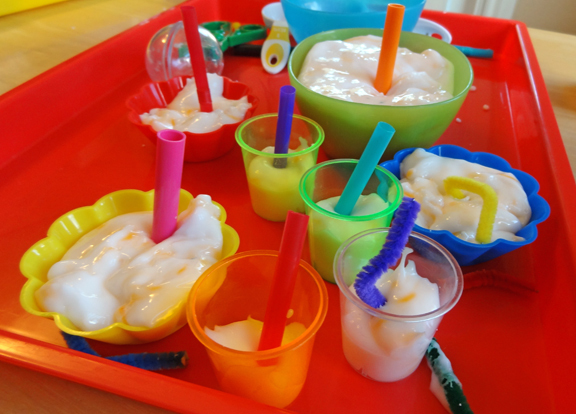 Once I had the flubber ready, I set up an invitation to play for my kids. 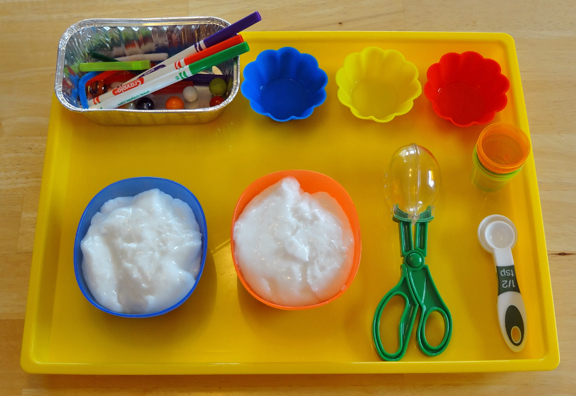 On a tray for each kid, I set out two bowls of flubber, scissor scoops , silicone baking cups, mini cups, measuring spoons, and a container with markers, marbles , and cut up pieces of drinking straws and chenille stems . When QBoy first sat down to play, his first inclination was the smell the flubber. Then he wanted to stick his fingers in to get a feel for it. XGirl started rolling a marble around her flubber. Then she found the markers, and decided to start drawing on the flubber. We were all really surprised with how easy it was to draw on the flubber with markers. Plus, the colors appeared so vibrant! Eventually, both kids decided to use the flubber to host a birthday party. 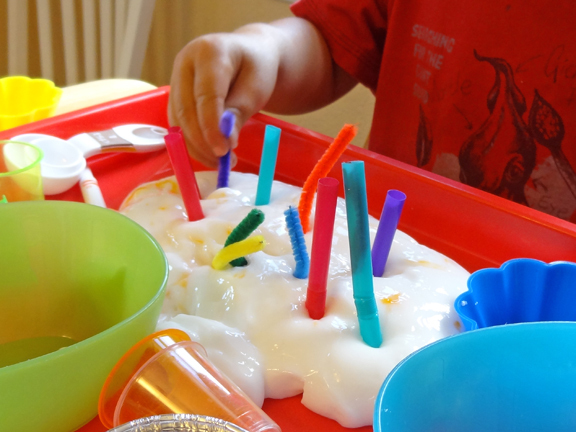 QBoy made a flubber “cake” and used the cut up pieces of drinking straws and chenille stems as birthday candles. Then he decided to make lots of separate cakes, each with its own candle. And he made a huge, wonderful cupcake for me as well. XGirl made some very colorful cupcakes in her silicone cupcake liners. The kids enjoyed this activity for over an hour. They were still at it when my husband came home, and eventually we had to drag them away from the flubber to get ready for dinner. 🙂 That’s the sign of a good activity, I say! I love how you drew on it! So cool!!!! I know, right?!? Who knew you could actually draw on this stuff?!? 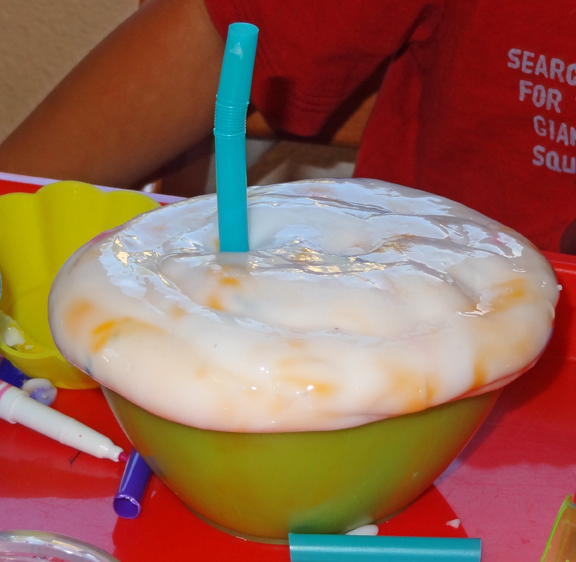 I am so adding it to my Pinterest board of “concoctions for play” – thanks for sharing with Afterschool! My three year old saw the first picture and said “Yum!” 🙂 What an interesting idea for sensory play — a new one for me. Thanks so much for sharing at After School! That looks like SO much fun! Thanks for sharing at the After School Linky. I’m featuring this at the party tomorrow. 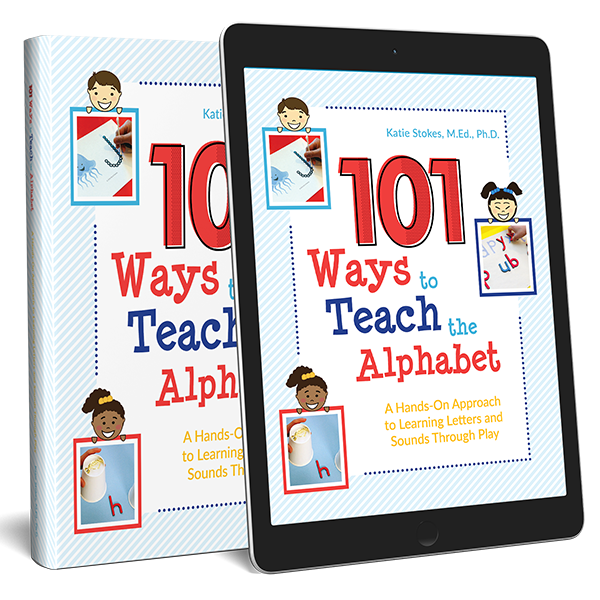 Stop by my blog to check it out and keep on sharing. I always love to see what you link up! Try putting some in a strainer or strawberry basket and hanging it over the table. It oozes down and you can cut it! What a cool sounding idea! I will have to try that next time we make flubber! 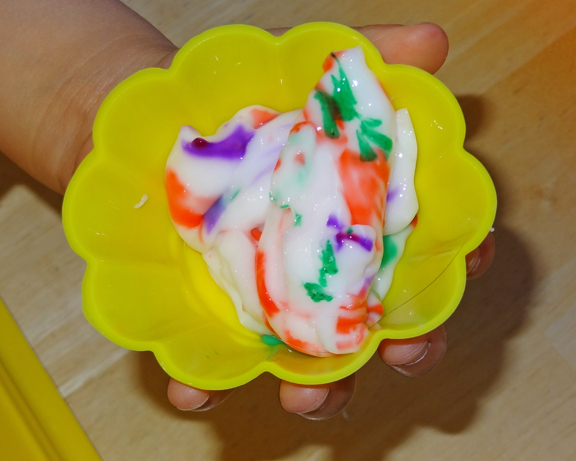 Oh I love flubber, my oldest daughter has had so much fun with it and we never thought to do half the stuff your kids did with it. Guess we need to make it again! So fun! This is something I’d like to try with the kids! PInned! 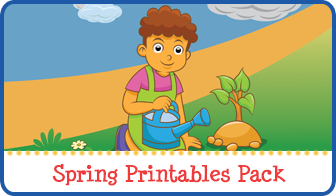 I have used this activity with my Pre-K students for many years. 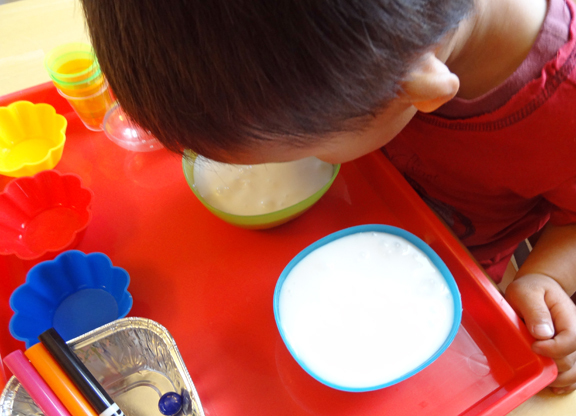 We use equal part Elmer’s glue and water then take about 1/4 -1/3 a up of warm water per student and they stir in a heaping teaspoon of borax then dump it in the bowl. They stir it around with their fingers and lift out what clumps together. They color it with markers and then the fun begins. Each student gets a straw when they are finished coloring and flatten their gak (we don’t call it flubber) into a taco shape. Lay the end of their straw in the middle of the circle. Fold it over and seal the edges. Pinch the gak tight around the straw and blow gently. After a few practices they will get a bubble. The thicker the gak is around the straw the bigger the bubble will be. Some students have blown bubbles as big as their heads. If you are going to blow bubbles the next day it needs to be heated for 10-12 seconds in he microwave. I pull it out of the corners of the plastic bag and put it in the middle of the bag. Check to see if it breaks apart when you pull it. If so it needs a bit more warming. It needs to stretch instead of break. This keeps 2-3 months if tightly sealed in a plastic bag. If you do not seal it completely it will creep out of the bag and dry out. 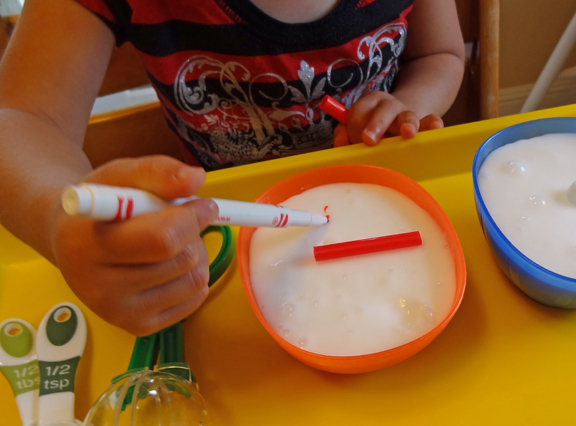 This is one of my favorite exploration/sensory activities to do with my students. 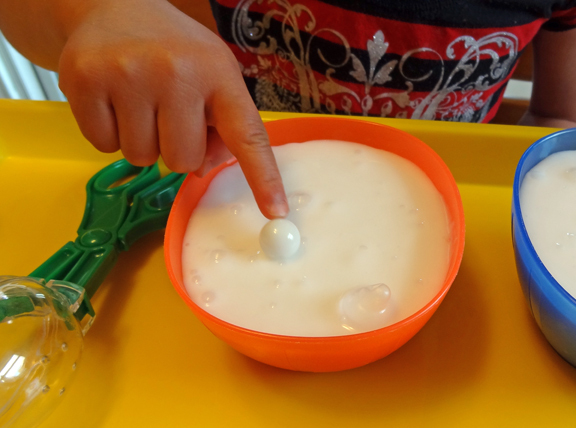 Great tip about blowing bubbles into the flubber (aka gak) with a straw! I never thought to try that, but it would be a great idea! Needed something fresh while mom is recouping from pneumonia… you never fail me. Truly an answer to prayer today. Thanks for the flubber! 🙂 So glad this helped. And feel better soon! This looks great! 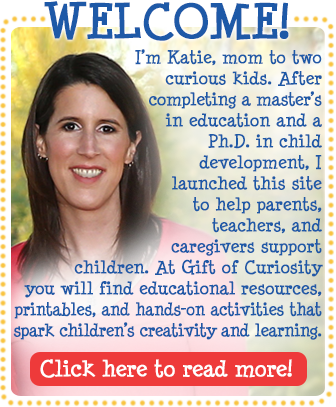 Just wondering how messy it is…I homeschool my three toddlers so I just need to know what to be prepared for! Does it stick to their hands and does it wash out of clothing? Thanks! From what I recall, the flubber was not sticky at all. It actually felt wet and slippery more than sticky. It was not particularly messy either, I don’t believe. It almost held together like gelatin. We used a washable glue, so all of the ingredients were ones that would wash easily from clothing if the kids get it on them. 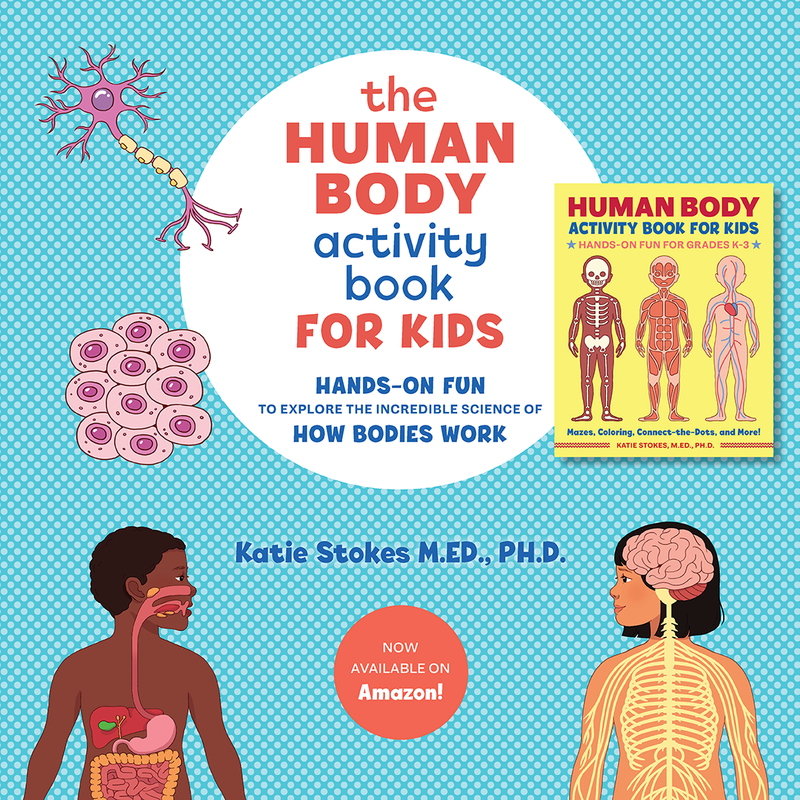 If you try this activity, I hope you and your kids will enjoy!